There was a good selection of fish on the markets around the UK this morning and we have a superb specials list to take us through the week, including squid, palourdes, gurnard, stone bass, gilthead bream and pollack. 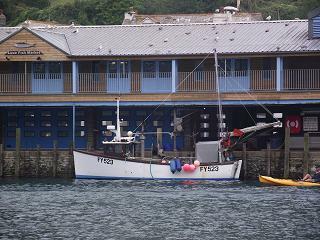 We have fish coming from Plymouth, Looe, Brixham, Newlyn and Shetland markets tonight. Plymouth market had a fair selection of fish today and we have an excellent variety of dayboat caught fish coming to us tonight. Plenty of most types of fish there, including mackerel, lemon sole, monkfish, john dory, Cornish sole, lemon sole, squid, plaice, hake, turbot, brill and lots more. We are collecting every day from Plymouth market. Please scroll down for availability. Looe market had a big market with lots of selection today, and we have several boxes being collected today of prime dayboat fish and some shellfish too. Looe fish is second to none and will have the best shelf life of any UK market due to small boats, careful handling and lots of ice! We consider Looe to be as close as you can get to a sustainable market, as the weather often prevents the small boats getting out, which gives the fish a natural break many times per year, allowing them to replenish stocks. We collect from Looe almost every day. Brixham had some excellent landings today, and we have a good range of fish coming from there including plaice, gurnard, squid and bass today. From Shetland and from the North Despite the high winds and rain currently hitting the Shetland Islands, we have some superb MSC-approved haddock and beautiful large cod. We find Shetland to be a superb market – strategically placed at the very heart of northern Europe's rich fishing grounds; Shetland's fish markets are ideally suited to attract landings of premium quality fish at the peak of freshness. Black bream - Fabulous new season fish, landed on small boats on the south coast. Brill - Have been dayboat-caught are coming through in good numbers. We are buying most days on Plymouth or Looe. Cod - We have large whole fish coming tonight and daily from Shetland. These fish are absolutely stunning and we also produce our own scaled and pinboned fillet from this. We are also able to cut portions of any size or spec as well as supplying cod cheeks. Conger is a fish that we buy as part of our New Wave bouillabaisse mix that we make up with conger, gurnard, whiting, john dory and red mullet if available. Also be sold separately. Cuttlefish is dayboat caught and coming tonight from the market. Although we may not always have it available for answerphone orders, we can usually buy it for you and supply the next day. Dover sole are expensive at the moment. We have a few coming through the week from Cornwall and Devon ranging from 300–600g but can get you any other size to order. Gilthead bream is now a really popular fish and is available from New Wave in 3 sizes: 300-400g, which is a small whole portion; a medium fish at 400-600g; or a larger fish suitable for filleting at 600-800g. The flesh on these is firm and it has a great shelf life. Grey mullet - Spanking Cornish fish are available in the 500g-1kg, fillet portion size. but we often have the bigger 1kg+ size too. Gurnards- We have some stunning bright red fish ranging between 300g and 1kg roughly, coming through tonight and through the week. We also use the smaller fish for our New Wave bouillabaisse mix. Haddock is our biggest-selling white fish and we specialise in this product, grading whole fish within 50g increments, being able to offer consistent-sized fillet normally six days a week. We either buy Cornish dayboat-caught when available, or otherwise the stunning Shetland MSC small boat caught fish. We do all our fish preparation from scratch on these, meaning that we can offer the best possible quality. Hake - We nearly always have in the 2–3 and 3–4kg sizes. It's abundant and massively increasing in popularity and after getting the thumbs up from the MSC looks like this will continue. We can also cut fresh portions as required. Halibut is farmed and from Norway. These fish are 2-3kg, spanking quality and ideal for cutting into chunky portions. We tend to avoid wild halibut as there are sustainability issues. Herrings- We can supply these whole, filleted or butterflied. We would normally buy them on Plymouth or Looe market off one of the smaller boats. John Dory prices on the smaller fish are very sensible at the moment. We have the smaller fish 300–500g size coming tonight but can also get bigger fish of 500g–1kg or 1kg +, but there's a huge difference in price. Lemon sole- We have this coming from Looe and Plymouth tonight and all week. These are spanking, always dayboat-caught, portion-sized fish we don't buy any lemon sole from up north or Scotland as the quality is never as good. We can skin and trim these as required – a bit pricey this week but that could change! Mackerel- We're getting some large spanking line-caught fish down direct from Shetland on a daily basis. Excellent quality and big enough for a fillet as a generous starter or modest main course. Megrim sole- are now abundant and we have portion-sized fish coming through as well as larger 2 portion fish up to 800g. Monkfish- We have small tails of fewer than 250g coming tonight, large tails of 1–2 and 2kg + also coming tonight and virtually every day. We buy the fully trimmed tails, top quality, not the Scottish flappy ones yielding less flesh that are available from some suppliers! (We wouldn't mention them of course!) Monk cheeks also available to order. Plaice- is coming through tonight and daily, landed on small boats. Plaice is a fish that we will normally always have in several sizes from the portion sized fish 350-500g suitable for serving whole, or the 600g–1kg and 1kg + suitable for filleting or tranching. Pollack- Still coming through to us every day and is currently very good value. These fish are usually dayboat-caught 2.5kg + and will yield thick, chunky fillet. We can also sell individual chunky pollack portions, cut fresh to order if required. Ray wings- Dayboat caught, coming up tonight and most days from Cornwall, normally 500g–2kg, but we can normally grade as required. Red Mullet are starting to appear now and we're starting to get some 200-400g fish through from Cornwall, which are roughly main-course size, or a fillet as a starter portion. The best fish we can get come from Looe, perfect specimens with no scales missing! Salmon- Wild season has ended now and we'll have to wait until next year now. However, we stock farmed salmon, such as the Loch Duart from Scotland, Var from the Faroes and also a standard Scottish farmed. Our salmon fillets are all scaled, filleted and pinboned at New Wave. We can also cut portions. Sardines are coming through to us most days subject to weather, although the ring-net boats haven't really got going properly yet, but we'll be getting these through the summer months for sure. We can supply whole, or scaled and gutted or butterflied. Seatrout- The wild season has now started . We are getting beautiul quality fish from nr. North Shields. Seabass- Wild, spanking-quality fish coming tonight and through the week either from Cornwall or Pembrokeshire ... prime quality. We have 1.5-2kg, which is a good-sized fish but keeping the price down, or the prime-sized 2-3kg fish, yielding those chunky portions that are so desirable. Swordfish comes to us in large chunky 2–3kg loins, normally from Sri Lanka where it is pole-caught. We can supply loins or freshly cut steaks to order. Trout- We normally have the portion-sized rainbow trout which we collect daily from Bibury Trout Farm. We also carry the larger jumbo fish. Tuna- We buy from Sri Lanka – superb red sashimi grade, perfect for eating raw or searing for rare steaks. We can also cut steaks for you to order. Turbot- The wild prices are up and down almost daily. We're bringing some lovely dayboat-caught 2–3kg and 4kg + fish up from Cornwall tonight. We also buy turbot when available from Shetland. Please speak to the sales team for availability. Whiting is being caught on dayboats in good numbers at the moment and we are buying daily. We usually have fish between 500g and 1.5kg. It gives a good single fillet fish and chip alternative to the more expensive haddock. Cockles come through to us daily, usually from Poole harbour or Brixham. Crab We buy live crab almost daily from the Brixham/Paignton area. We now sell all our crabs on a pre-order basis. Crabmeat We stock several qualities of white, the very finest being the freshly handpicked premium chunky crabmeat from Devon. We also carry a decent pasteurised version and below that, if you're looking for something cheaper, we have the Asian long date blue swimmer crabmeat. We also have a superb pasteurised brown crabmeat from Devon. Dressed crabs we normally just keep the pasteurised version but can supply a premium hand-dressed crab to order. Crayfish From Cotswold rivers and spring-fed lakes. Usually medium to large. They make a great stock or bisque and are very well priced. Crevettes We have a supplier on Rungis market who send us raw and/or cooked crevettes as required. These come in a variety of sizes from under 10 pieces per kg to 60/80 pieces per kg. Cut-off point for ordering is 8.30am for next day delivery. Langoustine We have a fabulous new supplier on the west coast of Scotland who specialises in live creel-caught specimens which are then transported to New Wave and to you in 'tube' boxes. These need to be pre-ordered by Tuesday for a Thursday morning delivery. We are also bringing down the cheaper fresh 'dipped' langoustines to order. Lobsters are available live from New Wave all year round. Native lobster are down in price. We have tanks at our depot and can usually provide you with the size of lobster that you require. Mussels are usually rope-grown, although when spawning we move across to wild. Our mussels currently come to us several days a week. Available in 1kg, 2kg or 5kg nets. Oysters We normally carry the rock oysters from Colchester on a regular basis as well as the superb Portland pearl oyster from Weymouth. In addition, we can get the flat native oysters from Colchester or the flat native Belons from France. Palourde clams are available in 500g or 1kg bags, usually from Brixham. We would normally have these every day. Razor clams we buy diver-caught from Scotland or Cornwall wherever possible and failing that the smaller French version. Scallops are available in several forms. We have live diver-caught scallops coming to us midweek from the Scottish Highlands. We also regularly stock the medium-sized Looe half-shell scallops. With regards to scallop meat, we do the superb large Scottish scallop meats and finally the USA roeless scallops. So pick your scallops! Whelks are available from a pre-order from France, evenly graded and consistent in 3kg bags. Winkles are also available from a pre-order from France, also evenly graded and consistent in 3kg bags. From Rungis we regularly buy Mediterranean stone bass, anchovies, freshly cooked and raw crevettes, brown shrimp and some any specialist products not available in the UK. Edible seaweed, such as nori, wakame, haricot de mer, dulse and sea lettuce, are also available to order. We can find you anything that is available on Rungis and normally deliver within 24–48 hours.